Many businesses are hiring people with disabilities, but Facebook is taking it a step further by putting a blind engineer in charge of a project that can affect millions of people. Matt King is using his disability to his company’s advantage by creating an artificial intelligence tool that helps visually impaired people “see” what’s going on and stay connected. King begins tapping the arrow keys to scroll through a Facebook timeline, with the voice leading the way. “Heading Level 5. Link. February 26, at 3:53 pm.” Next, it recites the contents of the friend’s post. “What a view, I really like my new camera.” Then nothing. The voice is quiet. King is quiet. There is no photo to enjoy. The screen is still dark. One billion people check their Facebook feeds every day, mindlessly scrolling through texts and photos to keep up with friends and family. King joined Facebook in June as the company’s first blind engineer to make sure millions of visually impaired Internet users around the world are not handicapped in their personal relationships simply because they can’t do the same. What do Starbucks, AT&T, Northrop Grumman and Ernst & Young have in common? A commitment to a diverse workforce that includes people with disabilities. Sarah Blahovec recently wrote about these companies and why they value hiring people with disabilities for The Huffington Post. Starbucks – When we think about hiring for Starbucks, we think beyond labels. We challenge ourselves to look beyond traditional sources and typical profiles, to bring in people that share our values and our passion for service and community. Northrop Grumman – We are committed to creating a work environment that values diversity and inclusion because it creates innovation, improves productivity and boosts profitability. AT&T – We are company where everyone’s differences are authentically embraced, valued and vital to our business inside and out. Whether it is by ensuring an accessible environment so employees can win at work or offering the accessibility products and services to our customers, accessibility is our commitment to connect people to the world around them. Ernst & Young – We seek the best talent, period. To find the specialized skills we need, we have to tap the broadest available talent pools, including people with a wide range of physical, cognitive and mental health abilities. People with disabilities often have well-honed problem solving skills and a degree of adaptability that are especially valuable in today’s fast changing business environment. At Nature’s Bin, a grocery store in Lakewood, Ohio, it’s not just the fresh produce and products that keep customers coming back. Many shoppers also love the store’s commitment to providing real work experiences for people with disabilities. Nature’s Bin is operated by Cornucopia, Inc., a non-profit that helps people with disabilities “develop skills and confidence leading to sustainable employment.” Cornucopia was founded in 1975 by Brian Daw and Anne McEvoy. “The hope was to create a place where people with disabilities could learn job skills and work in the community; quite a novel idea in 1975,” says Nancy H. Peppler, executive director of Nature’s Bin. Cornucopia’s original store, “The Bin,” offered training to 12 people with developmental disabilities every year. Today, Cornucopia helps upward of 200 individuals with special needs (physical or cognitive) learn work and social skills every year. Individuals work side-by-side a full-time staff member across many departments in a “real-work, real-world learning environment,” says Peppler. They might learn how to stock shelves, run the register, clean the refrigerator cases or master another visible job. Read the entire article in Whole Foods Magazine. A new coffee shop recently opened in Covington, Ky. with a mission to not only revitalize the downtown area but also to provide jobs for people with developmental disabilities. Point Perk, 104 West Pike St., took over a former restaurant space and is operated by The Point/ARC of Northern Kentucky. The coffee shop employs five individuals with disabilities along with professional baristas, and it also is a way to teach people in the community about The Point and its services. Michele Vaught’s face lights up when she talks about art. Her passion and talent are obvious as she sits in the Visionaries & Voices Northside studios. Michele Vaught works on one of her pieces of pottery at Visionaries & Voices in Northside. 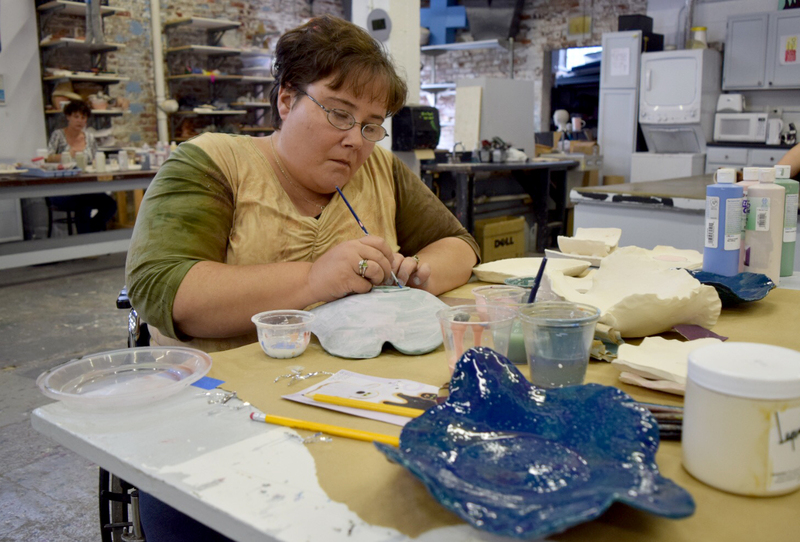 Vaught, 44, has been attending Visionaries & Voices since last spring and her focus is on clay. Recently she’s been selling her artwork at Under the Stars, an art consignment shop in Batavia, and at JuJu Beans, a coffee shop in St. Bernard. Every few weeks, Vaught takes a handful of her clay creations to each place, where they almost always sell out. She’s even had customers and friends commission original art pieces. Though Vaught loves what she does, she describes herself as a frustrated artist because sometimes the ideas she has in her head don’t translate to the finished work. Vaught, who lives in Silverton, said she plans to take more art classes to learn new ideas and techniques for her future projects.